The Baji You in mangong mode later called Xie Xian You (Embrace Immortal Roaming);6 these first survive as the Baji You dated 1609 but then occur under various titles in at least 21 handbooks through 1931.7 Their most common later title is in fact Xie Xian You. In either case the sort of roaming described cannot be by ordinary walking or riding: it must be done by riding in the air, perhaps on a chariot or a crane, but more specifically on a breeze, or perhaps on clouds, as in the illustration at right. Although this illustration more specifically refers to the later Xie Xian You melody (comment), since Zhu Quan's 1425 preface makes no mention of a specific person it perhaps might be appropriate here as well. Technically the ba ji (eight corners or boundaries) are those to north, east, south and west plus the four intermediary directions, but this is also a term found in ancient Taoist writings to refer to everywhere. 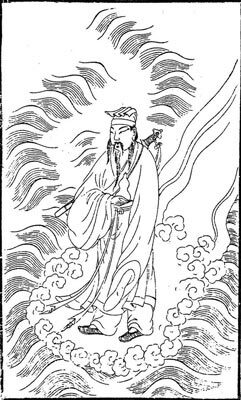 As for the Yellow Emperor, sources such as Liezi tell of his spirit roaming in the dream in which he travels to the land of the Huaxu Clan (see #3 Huaxu Yin), but these stories make no mention of ba ji (or liu he). And the Yingzhou10 of the section titles was thought to be an island in the Eastern Sea where immortals lived; the first emperor of the Qin dynasty (Qin Shi Huangdi) sent a mission there to search for the elixir of immortality. Although there are modern recordings of the Meian version of Xie Xian You, other than my own there are none of the old Baji You. this tune is probably a very lofty old one. The theme of the tune is in hoping to travel beyond the furthest distances, and rambling along the edge of the universe ("eight vastnesses"). It is like riding in a whirlwind cart pulled by heavenly wind-blown cloud horses, roaming freely on heaven and earth, and sightseeing around the universe; there are no limitations or obstacles. If one is not a person who, having thoughts of wandering, has left ordinary society, how could one express such sentiments? 八極遊 1475.377 has only 八極, with quotes from several sources including 莊子 Zhuangzi, 荀子 Xunzi and 淮南子 Huainanzi. In the Zhuangzi story (near the end of #21 田子方 Tianzi Fang) 伯昏無人 Bohun Wuren tells Liezi the higher man is unchanged no matter where he goes, even to all eight extremities (of the universe). Liezi (#2 黃帝 Yellow Emperor) has basically the same story but there the man is called 伯昏瞀人 Bohun Maoren. A net search for 八極遊 mainly turns up references to a martial arts novel 八極遊龍 Baji You Long by 雲中嶽 (云中岳) Yun Zhongyue. The title could mean "Dragon - i.e., martial arts hero - who is roaming everywhere", but perhaps it refers to the martials arts form called Eight Extremes Fist (八極拳 Baji quan; Wiki). In the Shen Qi Mi Pu Folio I melody Dun Shi Cao this lowered third string tuning is called 慢角調 manjiao diao. For more on the lowered third string biyu (and manjiao) mode see Shenpin Biyu Yi as well as Modality in Early Ming Qin Tablature. Note also that Xilutang Qintong also has melodies classified as biyu mode, but they use a different tuning, found only there. here called Mangong or Man'gong (see below). Although this image, from 中國的神仙 Immortals in Ancient China, p. 296, relates more specifically to the not so much to the present melody as to the later Baji You now known as Xie Xian You, it might also be used here for reasons mentioned in the text above. Compare the illustrations with those for Ascending the Great Void (Lingxu Yin) and Liezi Rides the Wind (Liezi Yu Feng). This tuning ( 3 5 6 1 2 3 5 ) is attained by slackening the 1st, 3rd and 6th strings one half tone each from standard tuning, giving 7 2 3 5 6 7 2, then transposing upwards so that the notes have the names of notes in the Chinese pentatonic system (1 2 3 5 6). In Shen Qi Mi Pu this tuning is used only for #11 Huo Lin and so, although Huo Lin does not have a modal prelude, the mode is discussed further in a footnote there. The Baji You listing, which gives alternate titles as Xie Xian You and Shen You Baji, includes these titles in 15 handbooks, but mixes the biyu versions with completely different ones in mangong mode. It can thus be seen that the biyu versions were all published prior to the mangong versions, discussed above and traced below, except for the reprint of the biyu version in the 1670 handbook. It might also be noted that although both of these versions are sometimes connected to the Yellow Emperor, only the latter melody (see next) mentions the Huaxu lands. Also transliterated Xiexian You, Xia Xian You and Xiaxian You. Other translations of the title include Voyage with the Immortal. To achieve mangong tuning from standard tuning lower the first, third and sixth strings (or raise the second, fourth, fifth and seventh), giving 3 5 6 1 2 3 5. Versions of this melody from later handbooks as well as other melodies using this tuning may give the mode other names. The earliest version of the man'gong melody is the Baji You in the 1609 edition of Boya Xinfa, part of Zhenchuan Zhengzong Qinpu, also called Qinpu Hebi (VII/208). Nevertheless, it is listed in the Zha Guide together with the old biyu versions of Baji You. In all, mangong tuning versions survive in over 20 handbooks (details) from 1609 to 1931 (Mei'an Qinpu). The earliest version to use the title Xie Xian You is the one in 1634 (IX/365; no commentary). Some introductions to this man'gong version connect it with the Huaxu story from Liezi. Only the first one, 1609, seems to connect it with Lü Chunyang (depicted above). The second surviving commentary, in Youshengshe Qinpu (early Qing; XI/158), discusses only the tuning/mode. Youshengshe Qinpu often refers to "嚴譜 the tablature of Yan", i.e., 嚴澂 Yan Cheng, whose Songxianguan Qinpu has only melodies using standard tuning. This makes Xie Xian You (which Youshengshe Qinpu says is "夷則，宮調 yize, gongdiao") different from the melodies of Yan Cheng. However, Youshengshe Qinpu refers to 嚴澂 Yan Cheng as 嚴徵 Yan Zheng (see XI/180 "嚴徵評"). Since this "徵 zheng" can also be "徵 zhi" (i.e., zhi mode), it is not always clear when the text here, which writes only 徵, is referring to the person rather than the mode. There seems to be no discussion of what makes it "gong diao". This was written because Lü Chunyang, having attained the Dao, flew up to the heavens. I reverently describe this with Chu-style lyrics (they are not in the actual Chu Ci), capturing only a small part." Although I have not been able to identify the source of this poem, it seems largely to consist of phrases already found in lyrics accompanying the older version of Baji You included in 1585 (in ToC). It might be mentioned that both handbooks were published in Nanjing. After the 1609 preface, at the beginning of Section 1, is the statement "關中琴友王龍泉校 revised by qin friend Wang Longquan of Guanzhong" (the central 陝西 Shaanxi plain). Precisely what Wang did is not clear. There are problems determining notes because Yang Lun's handbooks generally use only "half" for intermediate notes instead of using the more precise older system. Interesting, in the first occurrence of "6 1/2" meaning "6.2" (see Section 5, 1st line) there is a note in the column saying "小半", which only makes sense if interpreted to mean that the "半" here is a little one, i.e., less than half (6.2). Other qualifying comments are not so clear (e.g., 妥 in the next column). Although I have written out a transcription, I have not yet learned to play it. Nevertheless, from looking at the tablature and playing the transcription (in Encore) electronically, it is easy to see that this earliest version, though musically related, is much longer and more complex than the modern Meian version. There are modern silk string recordings of the Meian Xie Xian You by Zhu Xichen and Wang Duo. According to the Meian preface (as translated in Lieberman, p.125), "This composition is light and relaxed, with great feeling of floating like a heavenly spirit. According to tradition it was written by (the Yellow Emperor); it is supposed to simulate his doctrine of nurturing life (yang sheng)." This melody is introduced above. As mentioned, although the Zha Guide gives a separate listing for Xie Xian You (33/255/---) it is necessary also to look at the tablature listed under 8/83/133 Baji You and 28/225/--- Shen You Baji to get a relatively complete list of the melodies related to the present one, which actually survives in about 20 handbooks from Yang Lun Taigu Yiyin (1609 edition) to Mei'an Qinpu (1931). Although its earliest surviving version is called Baji You and this name is also used with some of the later mangong versions, it is unrelated to the earlier melody of this name, which uses 碧玉調 biyu tuning (lowered third string). Although the mode names beginning 1702 vary, all seem to use mangong tuning. It is not clear why Zha Fuxi made a separate entry for this title. See above: the earliest version of the Xie Xian You melody in man gong mode, which connects it to a story about Lü Chunyang, one of the nicknames of Lü Yan. A story about him from a Chinese opera. 11. The original Chinese text is on a separate page. This chart is based mainly on Zha Fuxi's Guide 8/83/133. Each occurrence is preceded by a modal prelude (see further). See also above for the later version of Baji You that also became known as Xie Xian You. 捷要 (1573; --) 6; see in ToC: identical to 1585? Lowered third prelude is missing, so seems to come after Huo Lin in Man Gong tuning. (1670; XI/424) 6; almost same as 1425; say 琴史 Qin Shi attrib. Yellow Emperor, but 朱長文 didn't mention him.